Ever since my coworker told me about her deconstructed sushi rolls they have become a weeknight mainstay for me. Even though the recipe is ridiculously simple and doesn't require any measuring or hard to find ingredients it just had never occured to me eat the ingredients I would put into sushi in the form of a bowl. Any time I make a dish that includes rice I cook a double batch. All the leftover rice gets divided up into baseball sized servings in plastic bags that I place in the freezer. For the deconstructed sushi I just heat up one of the servings of frozen rice in a bowl with a wet paper towel over it and then I stir in rice vinegar, soy sauce ( I use Braggs liquid aminos) and whatever other ingredients I'm in the mood for that night. Generally it's just avocado and cucumber but occasionally I'll stop by the store on my way home and grab a crab leg to add in too. 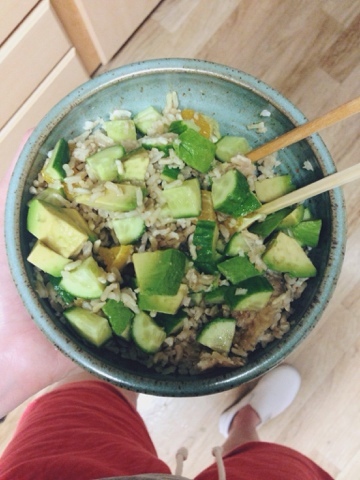 Other things I've used and loved are shredded carrot, asparagus, shredded nori and mango. I had to share this simple but totally brilliant discovery.